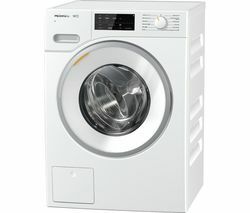 Miele are a top manufacturer of washing machines. If you’re looking to upgrade your current machine or cut down on trips to the launderette, Miele have a range of washing machines that will suit all budgets and situations, even if you have limited space. Miele washing machines can cope with large and heavily soiled loads, so they can make a big difference if you need some extra cleaning power on laundry day. 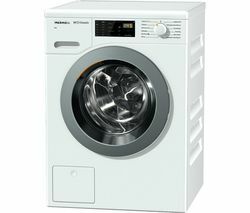 Save time and energy with a versatile Miele washing machine no matter how much or how often you need to do the washing. If you're in a hurry, choose a short cycle and you’ll be done in no time. Shorter cycles not only save you time, they are use less water and as a result, they’re better for the environment. If you have a big family, choose a Miele washing machine with a large load capacity and you’ll notice the effort of doing the washing is reduced when you need to do fewer loads each time. You can trust a Miele washing machine to get the job done and leave your clothes spotlessly clean and fresh after every wash.
Miele make washing machines you can trust, regardless of whether you need to wash a huge pile of clothes, furniture covers, bedding or running shoes. Need a space saving washing machine? Check out our range of built in washing machines, that will fit beautifully into your kitchen.